When you are injured in an accident due to someone else’s negligence, medical bills and lost income are often not the only things you are after. If you are like many people who have been hurt by careless drivers, you want justice. After all, you didn’t cause the accident, why should you be the one paying the price? Some personal injury claims can be fairly settled without the assistance of an attorney. If the accident was a mere fender bender or the injuries were very minor, an attorney might not be needed. You may be able to reach a reasonable settlement with the insurance company on your own. On the other hand, if you have been seriously hurt, the last thing you want to do is to try to navigate the complex legal system alone. After an accident, you need an experienced attorney on your side. Hiring an experienced attorney levels the playing field. You may have the right to full and fair compensation for injuries and property damage caused by another person, but the legal system is complicated, and insurance companies are not going to be looking out for you. Insurance companies would rather offer the minimum payout for property damages than give you a fair settlement, including payment for lost income, medical expenses, and pain and suffering. 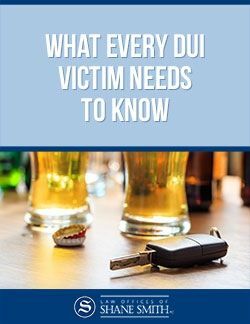 Many DUI victims don't know how or when to file a civil suit. If a drunk driver injures you, the person responsible may be sentenced by a criminal court, but does that pay your medical bills? Your auto accident attorney can explain the laws and settlement options for DUI victims. If you are ready to get answers to your questions, contact injury lawyer Shane Smith by calling 770-487-8999 or filling out our online form. We will review your accident case, free of charge, and explain your legal options. Your Georgia Property Damage Plan of Action - This step-by-step guide is necessary for anyone who is involved in a car, truck, or motorcycle accident. 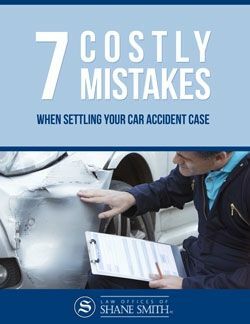 10 Mistakes That Can Ruin Your Georgia Wreck Case - This book will show you the top ten things to avoid when you believe that you have an Atlanta accident case. View more free books and resources available from the Law Offices of Shane Smith and begin gathering valuable information about your case. Contact the Law Offices of Shane Smith today by calling 770-487-8999. Your Legal Team at Shane Smith Law can help guide you through the complex legal system when you have been seriously injured in a car accident or slip & fall. We will handle the adjusters, so you can concentrate on getting better. Call our team of personal injury attorneys to find out about our caring and responsive legal services for victims of DUI Drivers, auto accidents, big rig wrecks, pedestrian accidents, golf cart crashes, & slip & falls. 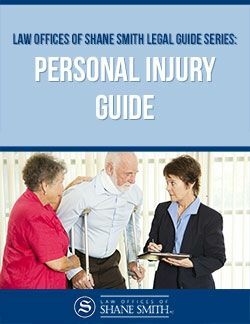 This Free Personal Injury Guide tells you valuable information about what to do if you are injured and how to get the most for your claim. Learn the top 7 mistakes to avoid when handling your personal injury claim - mistakes that can cost you thousands. Property Damage Guide . 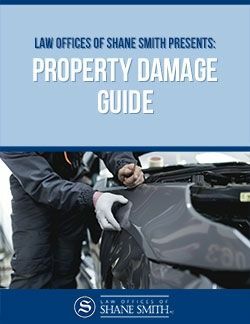 Request this Free Book written by Atlanta Lawyer Shane Smith to learn about getting the most money for your property damage claim. Victims of drunk driving accidents have different needs than "regular" car accident victims. Our free book, "What Every DUI Victim Needs to Know", helps these victims deal with the struggles unique to their drunk driving accident. 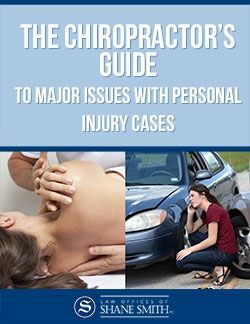 Car accident victims often need chiropractic treatment after a car accident. Every step taken can have a direct and real impact on the potential for compensation. Learn how to get the care you need and the compensation you deserve. 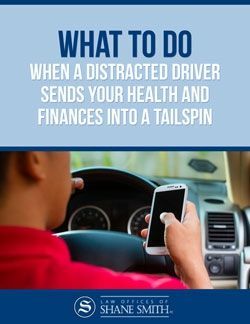 Victims of car accidents caused by distracted driving may face difficult physical and financial circumstances. This report explains your options. Slip & Fall claims are handled differently than car accident claims. Attorney Shane Smith wrote the book on Premises Liability. 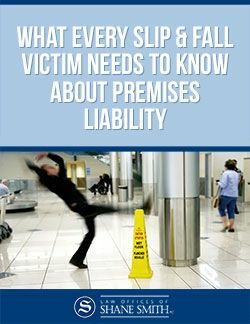 Get your free copy of and learn what every slip & fall victim needs to know about premises liability. 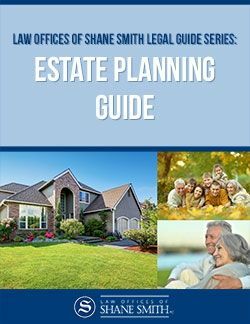 "Estate Planning Guide" contains the most useful information that every person should know about protecting their loved ones and their assets. 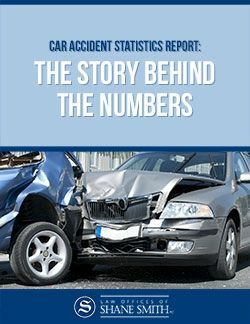 Attorney Shane Smith answers your questions in this free report about what you need to know before and after car accidents.